The BBC has unveiled full details of Eighteenth Century Britain: Majesty, Music and Mischief, a major new season exploring the extraordinary transformation that took place across the arts throughout the 18th century. The season will include programming on BBC Two, BBC Four and BBC Radio 3 in April 2014. More than 250 years since its composition Handel’s Messiah remains one of the most popular choral pieces in western music, containing the instantly recognisable Hallelujah Chorus. Yet few people know the heart-rending story of how this much-loved work first came to public attention. Messiah At The Foundling Hospital is a one-hour drama documentary for BBC Two presented by Amanda Vickery and Tom Service which re-creates the Foundling Hospital premiere of the Messiah in 1750. The performance was the first ever charity benefit concert in which art and philanthropy came together to raise money and it launched a tradition that every fundraising concert has followed since. 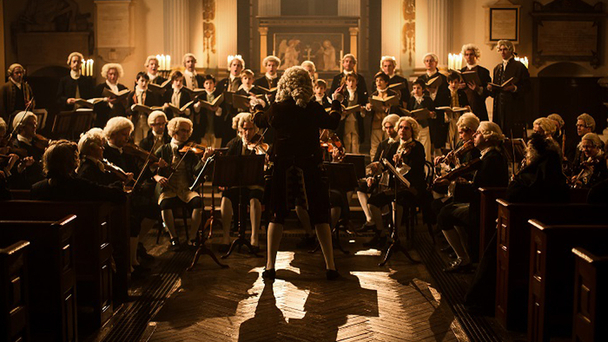 Messiah At The Foundling Hospital shows how Handel’s masterpiece helped save the lives of 25,000 people, and changed music forever. Three hundred years ago the Hanoverians succeeded to the British throne. To mark the occasion, the BBC and Royal Collection Trust are embarking on a unique partnership – encompassing a three-part series presented by Dr Lucy Worsley for BBC Four, and an exhibition at The Queen’s Gallery, Buckingham Palace. The First Georgians: The German Kings Who Made Britain (w/t) will present the surprising story of Britain in the reigns of George I and George II – the age of the ‘German Georges’. Lucy Worsley will reveal how this unlikely new dynasty secured the throne – and how they kept it. The exhibition which coincides the series is called The First Georgians: Art & Monarchy 1714–1760. The exhibition has been curated by Desmond Shawe-Taylor, Surveyor of The Queen’s Pictures. Also for BBC Four, Suzy Klein, broadcaster and BBC Radio 3 presenter, charts the social, cultural and political context of Britain and how this was reflected in the powerful music of this era in this three-part series. The Music That Made Britain – Patriotism, Pleasure And Perfection (w/t) will begin by exploring English music’s increased credibility with the fashionable upper classes in the 1700s along with the rise of the fashionable ‘English Oratorio’. It examines the emergence of mass popularity of music in the century and sheds light on the impact of war and rebellion on national identity which was marked by the creation of the anthems Rule Britannia and God Save The King. Acclaimed tenor Rolando Villazon explores the story of one of the best-known operas of all time in Rolando Meets Don Giovanni (w/t) for BBC Two. The first ever performance of the opera was an enormous success, delighting both Mozart and the city that had taken him to their hearts. But what brought them all, composer and audience, theatre manager and cast, to this time and place? Rolando explores the run-up to that candle-lit first performance, looking at the music of the opera and the social setting in which it was first performed, before recreating the finale of the opera which received such a rapturous reception. BBC Four present Kasper Holten’s mesmerizing new production of Don Giovanni from the Royal Opera House. Holten presents an exciting visual universe that ranges from colourful comedy to exhilarating drama. Starring Polish Mariusz Kwiecien as Don Giovanni the production highlights the beauty and invention of Mozart’s dazzling score, which ranges from gorgeous arias and dramatic duets to the brilliant layering of dance melodies that bring Act 1 to a virtuoso close. Tearing Up History, for BBC Four, is a journey through the dramatic and destructive years of the French Revolution, telling history in a way not seen before – through the extraordinary story of its art. Our guide through this turbulent decade is the constantly surprising Dr Richard Clay, an art historian who has spent his life decoding the symbols of power and authority. Also continuing both channels’ relationship with BBC Radio, the season will feature complementary programming on Radio 3 including live music and events designed to delve into the music, culture and society of 18th century Britain. The season begins with a special live edition of In Tune presented by Suzy Klein. As part of Radio 3’s continuing partnership with the National Trust, the programme comes live from Kedleston Hall in Derbyshire, a classic example of 18th Century British architecture. Suzy will be joined by Christian Curnyn and players from the Early Opera Company, performing music from the period and exploring the history of the house (Thursday 10 April). The Early Music Show will come from The Queen’s Gallery, Buckingham Palace where Carole Cerasi will play the 1740 Burkat Shudi harpsichord, part of the Royal Collection. Composer of the Week will feature three of the most prominent composers of the era – Thomas Arne, George Frideric Handel and Johann Christian Bach, while Suzy Klein will explore ‘Georgian Pleasures’ with harpsichordist and conductor Christian Curnyn every day on Essential Classics. Amanda Vickery will be choosing some of her favourite music and Lucy Worsley will be presenting a range of music from the era on Saturday Classics, whilst also on In Tune Sean Rafferty will highlight an object each day from the Royal Collection Trust exhibition, First Georgians: Art & Monarchy 1714-1760, beginning on 10 April which will see a total of 12 objects key from this historical period discussed, all of which will be available to download at bbc.co.uk/radio3.